Music for Armenia is a description of the Essence. His tracks are dark, dense, often restless and not indulgent with harmonic and melodic solutions which are simultaneously outlined. He combines an instinctive and intuitive approach with soundscape's meticulous care. 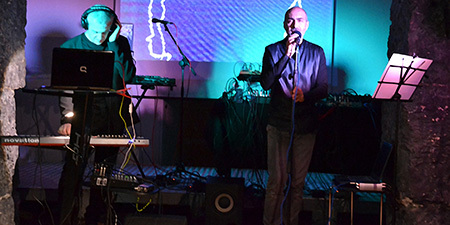 He presents in two different parts "ROOMS", electronic set which begins from a rarefied pulsation that becomes more and more tangible and concrete and crosses various forms, namely, the "rooms", including some tracks from the latest album "We Are Still Machines" (https://armeniamusic.bandcamp.com/album/we-are-still-machines). September 23, 2017 - Esplorazioni. "As above so below. 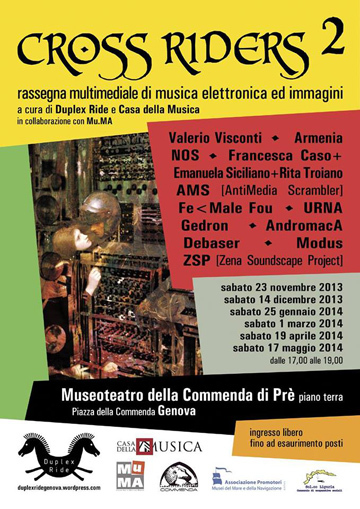 I realized: I'm an infiltrate in the world of machines and electronic music. Basic a subversive. 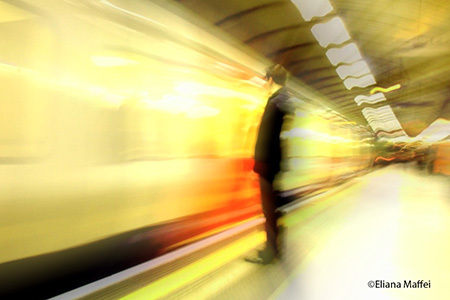 I go towards man and everything is adjusted for this purpose in various ways and paths. I install a human virus and I go to the result. Then the machines, both software and hardware, begin to bend, to heat up and become alive. Sometimes it's surprising. Alchemical operation in my sight. The Wise commands. In the background the Child and the Doomsayer." 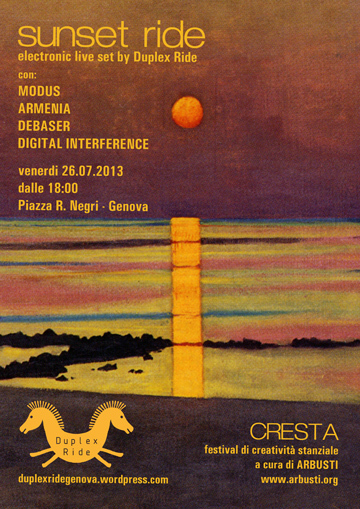 After traveling with the "IO È" show together with Kseij Dance Company, returning from Budapest, Armenia returns to Commenda in Genoa with his live accompanied by visuals. 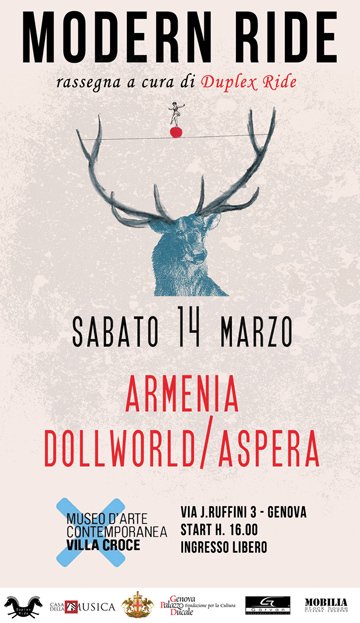 He brings the new restless studio album, WE ARE STILL MACHINES, preceded during spring by LIKE A DERVISH and published on Bandcamp (https://armeniamusic.bandcamp.com/album/we-are-still-machines). "Our true conscience can be, and in fact it's almost always, completely absent from all that we do, think, want and imagine ..."
In "ESPLORAZIONI" by DUPLEX RIDE, Armenia also pays tribute to Georges Ivanovič Gurdjieff, using frames of "Meetings with Remarkable Men", a movie released in 1979 written and directed by Peter Brook, taken from Gurdjieff's novel by the same name. May 26, 2017 - " IO È "
The " IO È " show created by Alekseij Canepa for Kseij Dance, aims today to represent through three acts how men with the advent of technology began to decrease constantly relations each other, increasingly becoming automata, almost like they were remote-controlled by others. 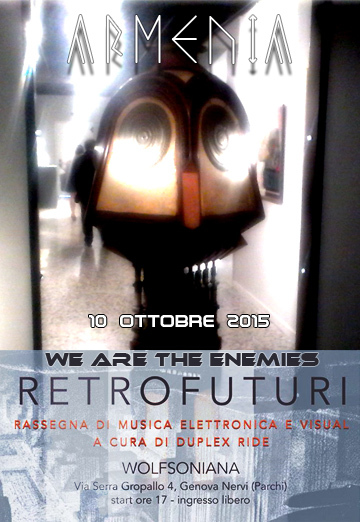 The new album coming out, from which " IO È " taps into, is "WE ARE STILL MACHINES". “Si può portare il bue assetato al fiume, ma, se non sarà lui a bere, morirà. Memory cluster. I miei ologrammi persistenti. Solo chi ha il coraggio di scrivere la parola fine, può trovare la forza per scrivere la parola inizio. C'ero soltanto. C'ero. Intorno cadeva la neve. 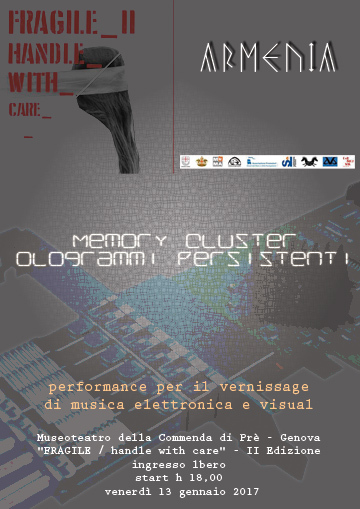 "Memory Cluster - Ologrammi persistenti"
Performance of electronic music and visual at the vernissage. 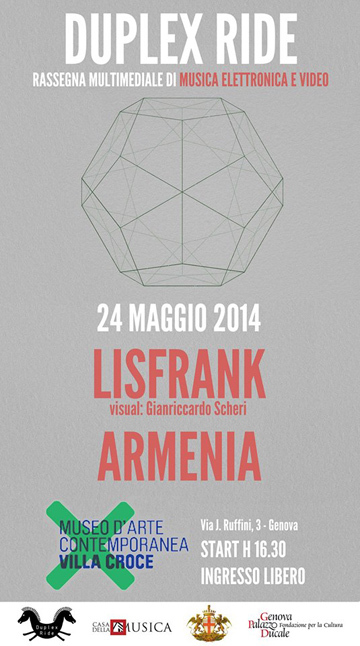 "FRAGILE / handle with care - 2nd Edition"
Collective contemporary art's exhibition curated by Benedetta Spagnuolo.
" Fragile – handle with care ", a radical extension of fragility's concept, which touches existential questions related to sensitivity, delicacy, human vulnerability and uncertainty, dilemmas and expectations. This itinerary starts from here and it's not only expositive, but inner, concerning an introspective reflection about fragile and ephemeral, material human condition. 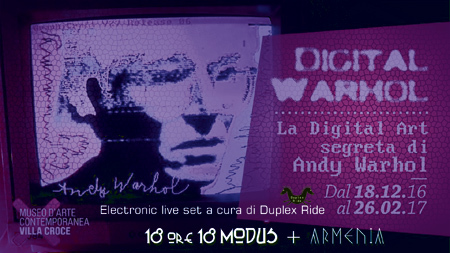 Sunday, December 18, 2016 at 18:00 Armenia's performance at the Museum of Contemporary Art Villa Croce for "Digital Warhol" exhibition's opening. 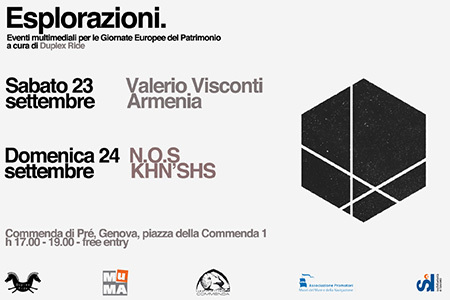 extracted choreographies from "IO È"
Second and final leg of Armenia and Kseij Dance's "Ponente Tour", after the performance in November at Ex Manifattura Tabacchi in Sestri. 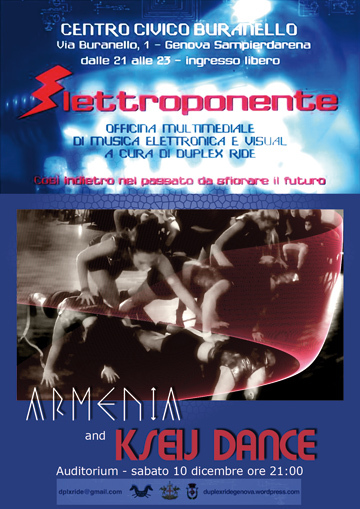 Through "Elettroponente" festival Armenia and the young Genoese Kseij Dance contemporary dance company arrive at Centro Civico G. Buranello's Auditorium in Genoa Sampierdarena for a not to miss Saturday night. Armenia, experimental electronic musician, brings the upcoming album "We Are Still Machines" in the mark of a new integration man/machine/gesture/dance. Enriched with original visuals and with now cold now warm movements of "Kseij Dance Company", the performance will be colorful and it will move between energetic, dark and introspective live electronic music. 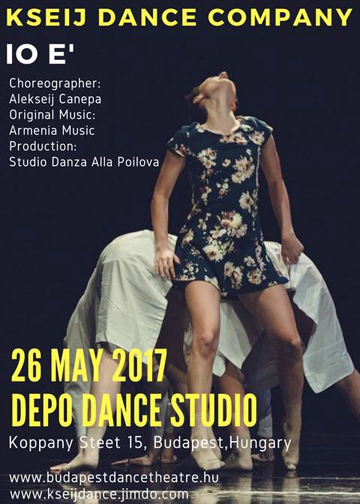 Armenia collaborates from 2016 with dancer and choreographer Alekseij Canepa and his "Kseij Dance Company", Studio Danza Alla Poilova's feminine emerging young contemporary dance company located at Sestri Ponente. The company, which will be on stage in the exciting final part of this live performance (curated by Duplex Ride), is currently formed by Sara Ferrera, Sara Gualtieri, Giorgia Ponticello, Chiara Ramone, Martina Sgarlata, Sindi Stana, Chiara Traverso, Alice Vancheri and Noemi Re (assistant to the choreographer). 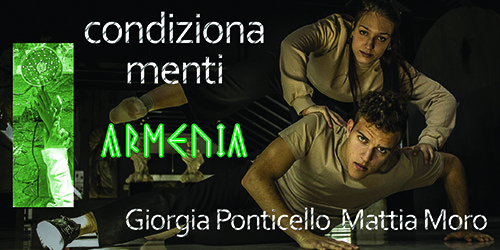 "Kseij Dance Company" arrives along with Armenia from recent Italian premiere of "IO È" at "Teatro Rina e Gilberto Govi" in Genoa. This show represents the transformation of mechanical man into machine. Armenia, experimental electronic musician, presents the upcoming album "We Are Still Machines" in the mark of a new integration man/machine/gesture/dance. 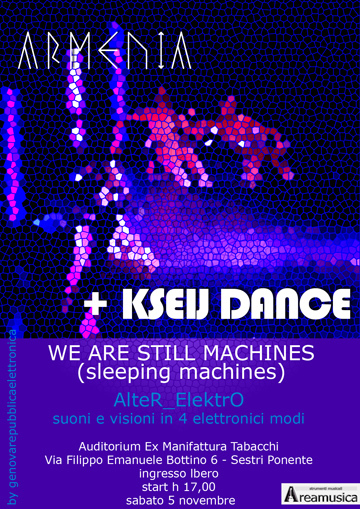 Enriched with original visuals and with now cold now warm movements of "Kseij Dance Company", the performance will be colorful and it will move between energetic, dark and introspective live electronic music. 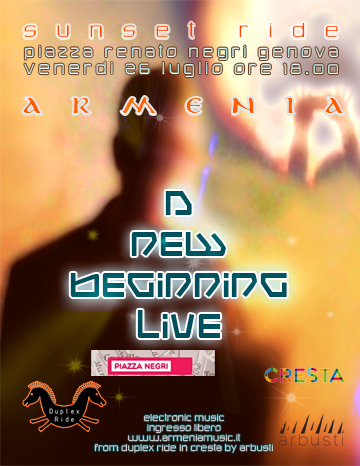 Armenia now collaborates with dancer and choreographer Alekseij Canepa and his "Kseij Dance Company", Studio Danza Alla Poilova's feminine emerging young contemporary dance company located at Sestri Ponente. 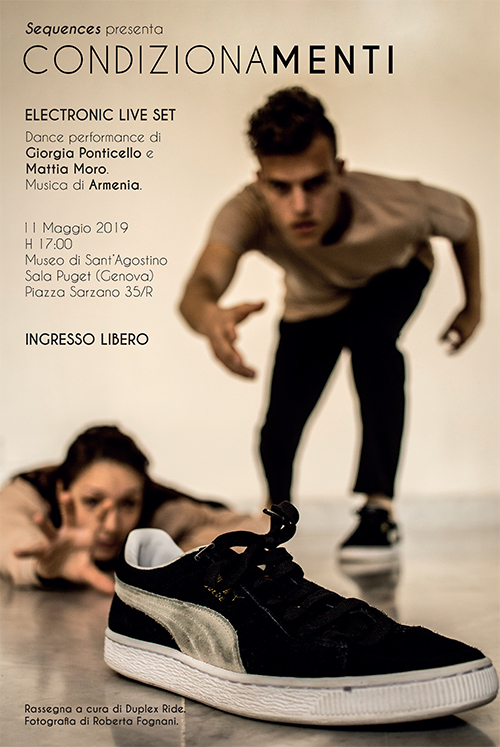 The company, which will take part in live performance in "AlteR_ElektrO", is formed by Sara Ferrera, Sara Gualtieri, Giorgia Ponticello, Chiara Ramone, Martina Sgarlata, Sindi Stana, Chiara Traverso, Alice Vancheri and Noemi Re (assistant to the choreographer). "Kseij Dance Company" arrives along with Armenia from recent Italian premiere of "IO È" at "Teatro Rina e Gilberto Govi" in Genoa. This show represents the transformation of mechanical man into machine. 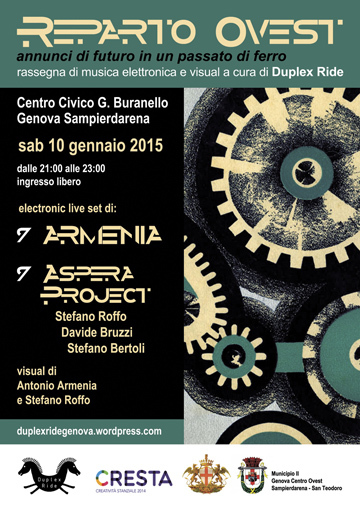 Festival of electronic music and visuals for "Alice's Adventures in Wonderland" by Duplex Ride. Lewis Carroll was a shy stutterer man who felt uncomfortable with adults. His first book was "Alice's Adventures in Wonderland" which was followed by "Through the Looking-Glass, and What Alice Found There". From the latter the director John Henderson in 1998 conceived an artwork targeted to adults. 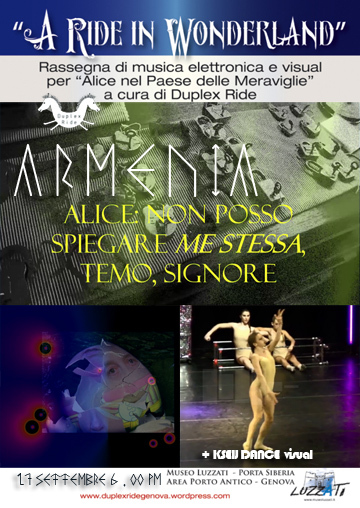 In his film (included in some visuals during Armenia's concert) Alice is a teenager and all characters are humanized. Costumes and makeup fully reflect the style of the 90's. It's the latest adventure of a teenage girl who now cannot escape to growth. She must therefore give up games, disobedience, fantasy, to devote herself to life as a wife and home's guardian. Also Carroll has to surrender to time, recognize his advanced age and give the last touching farewell to the girl who led him for a while out of social patterns and human logic. It seems infact that the White Knight who Alice meets is precisely the author, clumsy, full of tools he invented, old on his horse slowly drifting away on the horizon. 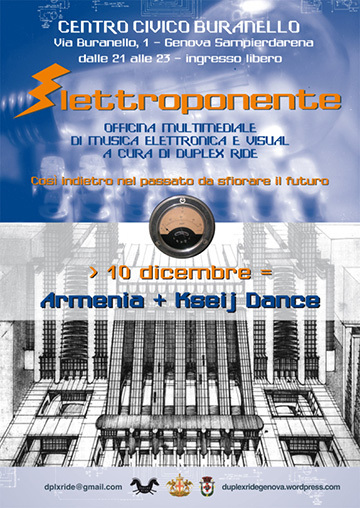 At the end the live electronic set will be also enriched by the video presence of the contemporary dance company Kseij Dance, with Alekseij Canepa's choreography for "Balance" that will close Armenia's live performance of his original electronic music, mostly taken from the outbound album "We Are Still Machines". 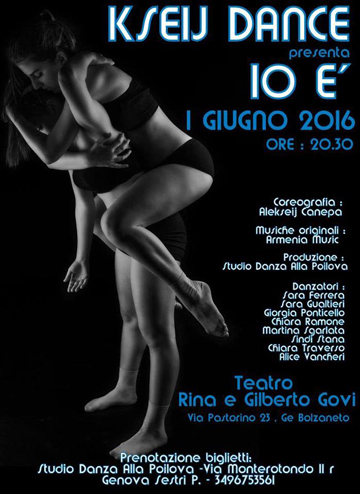 June 1, 2016 - " IO È "
In May 2015 Kseij Dance presented the Italian premiere of its own show "INTERAZIONI" at Teatro Verdi in Genoa. 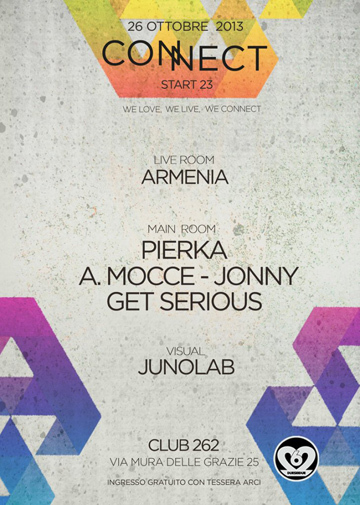 Armenia in 2016 presents the new tracks from "We Are Still Machines", in the mark of a new integration man/machine/gesture/dance. For this reason he opened a few months ago a fortunate collaborative research along with dancer and choreographer Alekseij Canepa and his creature "Kseij Dance Company", a young female contemporary dance company which belongs to Studio Danza Alla Poilova. 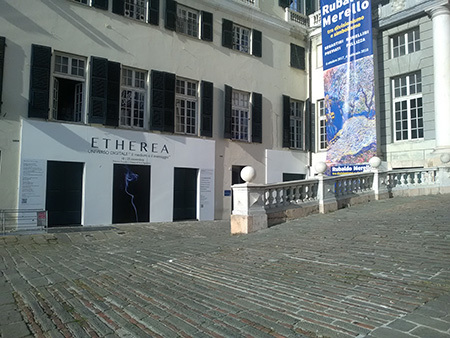 This will lead in Genoa on June 1, 2016 to the representation of " IO È " show's Italian premiere at "Teatro Rina e Gilberto Govi". 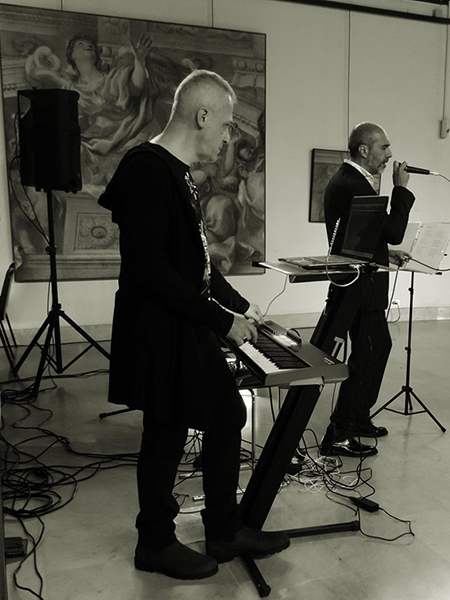 Already born electronic tracks have been re-assembled around the performance of the young dancers and will go to compose the album's definitive material, which will be mixed probably in September 2016 and which will be released digitally for download and streaming on Bandcamp and on main online stores such as iTunes. "Balance", "Like A Dervish" are some of the titles that will be presented as a preview. 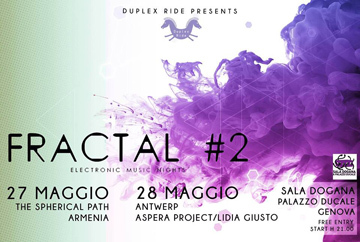 While waiting in Sala Dogana Armenia will present for the first time ever part of the material, enriched with new visuals, in a colorful performance that will range from the most energized by rhythm tracks to the more obscure and introspective ones. When imagining the future was a dream. 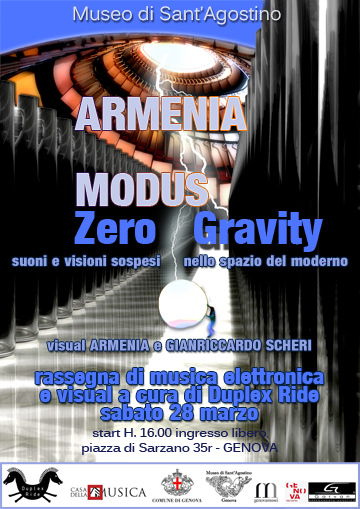 ARMENIA, with his experimental music and processed visuals, will approach an Orwellian future, currently disguised in a dystopian present and underlying theme of man's awareness and his mechanical nature. The new album, "We are still machines", is undergoing advanced production. As above so below. We are still machines creating other machines. 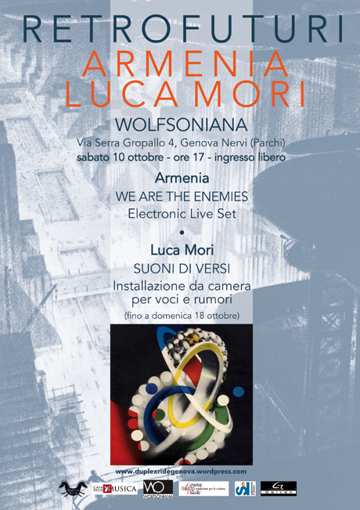 "We are the enemies", which also contains small audio samples of the reciting voice of the Futurism's founder Marinetti, is the first track that will anticipate everything and will be presented in preview at the concert for the festival RETROFUTURI at WOLFSONIANA by DUPLEX RIDE. Together with the previous "Slave" with the voice of John F. Kennedy and "Facing the abyss" with the text of the speech by Bush after September 11, the new track will complete the concert's lineup with an electronic triptych trying to grab the doublethink of our Western society. "You are the task" and "My secret heart" will bring us back to the heart and a more human dimension. 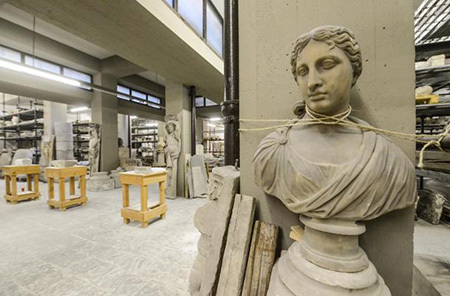 A powerful energy's spiral surrounds one of the rooms of the museum. 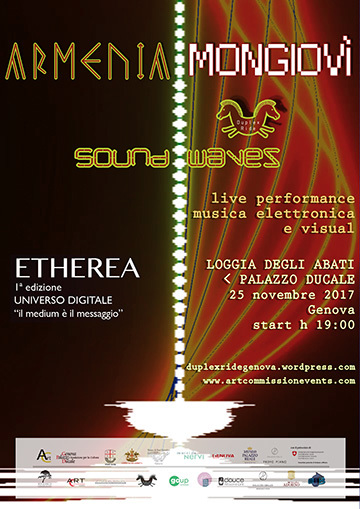 Abstract sounds, high and low electronic frequencies, accompanied by installations and modern images placed on the two hall's floors and around, surround the audience who moves for freely exploring possibilities for listening and viewing. 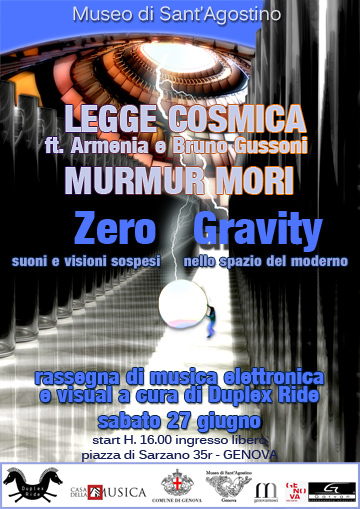 This is the icon of what will happen in the new festival of electronic music and visuals ZERO GRAVITY, sounds and visions floating in space of the modern, made by Duplex Ride through its artists for the first time at Sant'Agostino Museum: from March 28 to June 27, in Franco Albini's architectural setting. 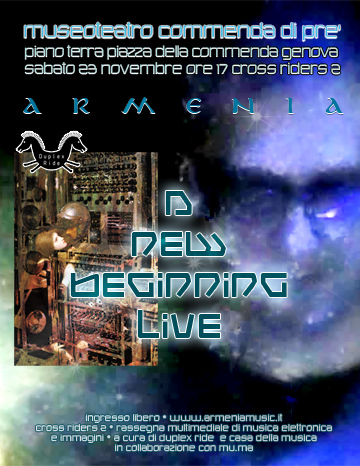 In REBOOT's wake, Armenia's first live electronic album, available in digital stores and on self-produced CD! 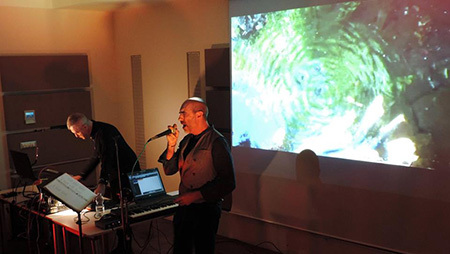 REBOOT, trustworthy picture of a whole concert, in addition to seven updated instrumental pieces from the previous studio album A NEW BEGINNING, includes three unreleased tracks, which were created during concerts in past two years: UNDER SKY, YOU ARE THE TASK (in double version) and LEAD ME TO LINES. To complete the album for the visual side nine corresponding live videos will follow: the first two are already available on YouTube and Vimeo (UNDER SKY/YOU ARE THE TASK and TO THE STARS). 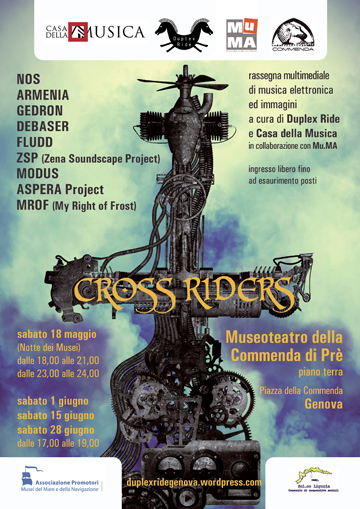 After the success of last year, in 2015 DUPLEX RIDE association returns between the walls of VILLA CROCE in Genoa. 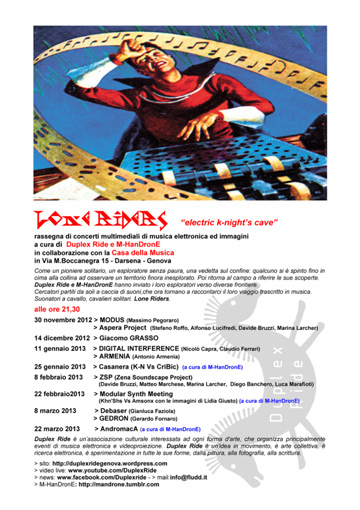 MODERN RIDE, a cavalcade into the future, a series of new appointments of vanguard music and of visual art, which finds its natural place within the context of the contemporary art museum. 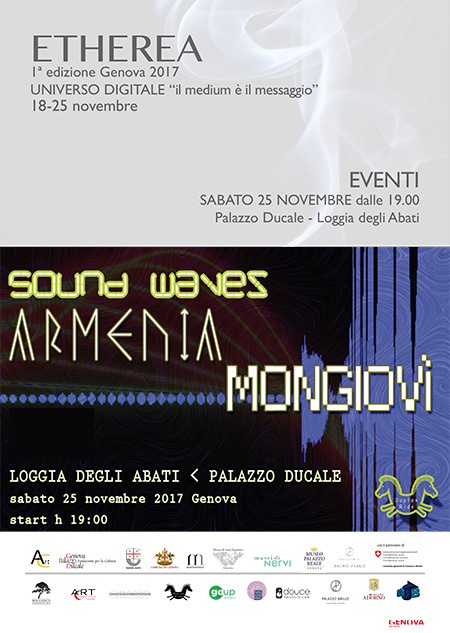 Armenia presents an electronic layered multi-level sound, in search of awareness and knowledge between instinct, emotion and mind. The inherited name ("Armenia") now looks like a destiny or an omen: his eyes and sensitivity connected to the most hidden East, bearing a versus narrative that counteracts the mainstream of today's society ("Facing The Abyss") and the enslavement of individuals and populations to needs that alienate their real nature ("Slave"), Armenia uses every modern tool to find and draw a line of energy capable of piercing and revealing the world ("A New Beginning"). Increasingly close to the realization of their nightmares and their own dark side the human machines must be restarted ("You are the task [Human machine needs rebooting]"). "We Are Machines" is today's new album in production after "A New Beginning", released in 2011 on iTunes. 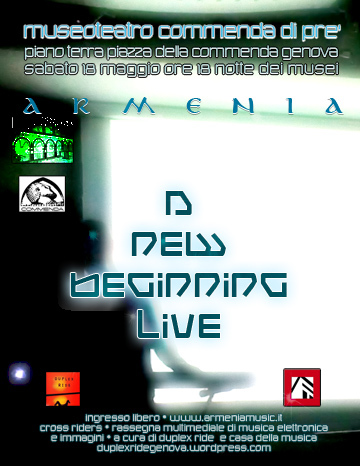 Armenia presents the new electronic live show based on tracks of "A New Beginning" and enriched for the occasion by new sound parts and for the first time by the live performance of "New Worldline" and two versions of "You Are The Task (Human Machine Needs Rebooting)", a track that saw its genesis on stage last year and reached the final elaboration, anticipating the new album in progress "We Are Machines". Particular emphasis will be given to the visual, which will insist on a strong sync sound/image (particularly for "Facing The Abyss" special guest G. W. Bush) to increase suggestions and impressions and which will collect new videos, such as "Saving Energy", recently filmed on the Celtic pyramidal building located near Rovagnate (LC), IT.